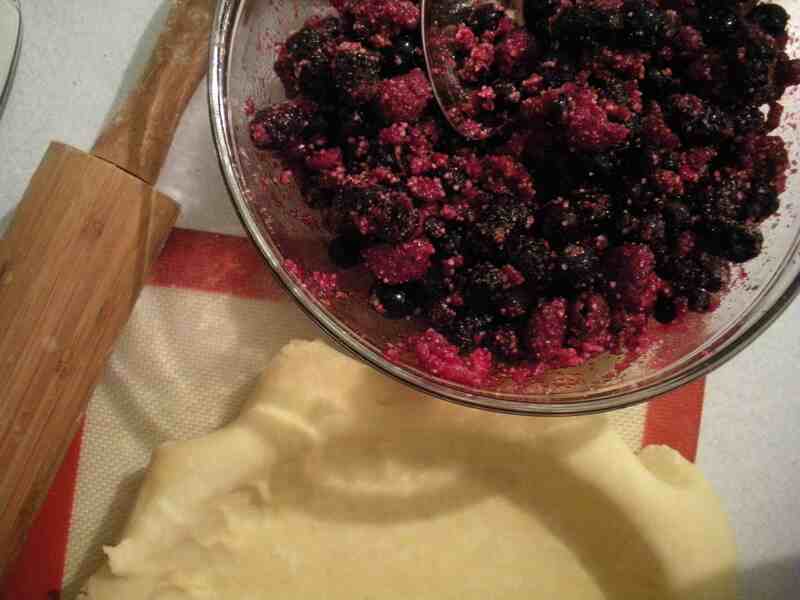 I made kind of a sloppy pie tonight—all of the frozen mixed berries left in the bottom of the giant bag I bought at Costco, lemon zest and lemon juice, cinnamon, nutmeg, some instant tapioca and enough sugar to make the fruit just barely sweet enough. I mixed the ingredients for the filling together and let them sit on the counter to thaw while I made the crust. My mom taught me how to make pie this way, following the guidelines on the Minute Tapioca box for the filling and the recipe for pie crust on the back of the Crisco can. Simple pies. I’ve been making pies with her for as long as I can remember, but, with the exception of the leftover bits that my brother and I shaped into leaves and birds, I never really touched the crust. Crimped edges and lattice work were my mother’s domain; I learned to be almost afraid of the temperamental layers of fat and flour, the alchemy worked by a pastry cutter, a glass of ice water, and a heavy wooden rolling pin. I finally asked my mom to teach me a couple of years ago. Pastry is no longer the mystery it once was, although my crimped edges and lattice work are still many decades behind my mother’s skill. This Thanksgiving, she’ll still make this pie crusts. I’ll make the filling. To (mis)quote Tennyson’s Ulysses, she works her work, I mine. What are you talking about? You make a brilliant pie crust! Didn’t you win a pie-making contest when you were twelve? Or was that a pie-eatin’ contest?